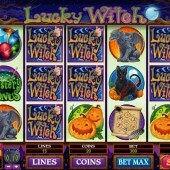 Stacked Wilds, a buxom beauty in the shape of a witch, and enough ghoulish symbols to last you a thousand Halloweens: with the witching hour upon us (or at least, it is where I’m writing this from) Microgaming’s great Lucky Witch slot is the perfect slot for vampires and vamps alike. A 5 reel, 15 pay-line slot, there are the customary Microgaming twists and turns to go with its friendly betting structure - $0.01 - $0.20 a coin – and enough atmosphere to shake a flying broomstick at. The moonlit backdrop puts you right in the mood from the off, as does the eerie soundtrack. Bats and owls keep you company while you spin as well. The animation is great, especially after a winning combo, with gargoyles waking up and our flame-haired witch throwing spells about like they’re going out of fashion. As well as our witch, we get on the reels dragons, potions, black cats, spell parchments and cauldrons. 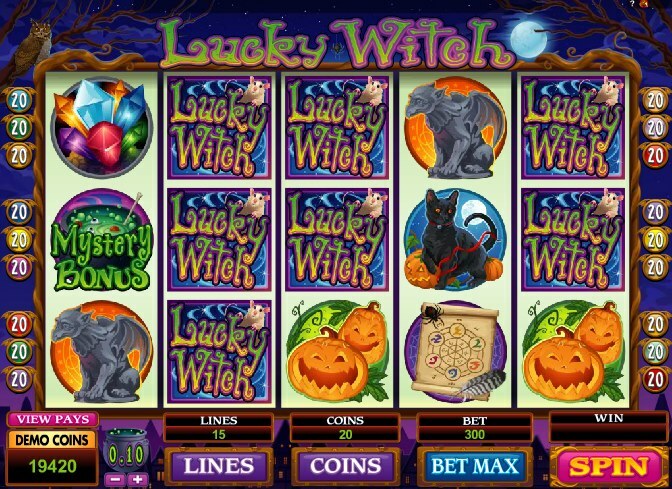 The Lucky Witch logo is the game’s Wild, and is stacked on each reel in sets of three. What that means for you is that a completed reel can spell (geddit?) big wins if you hit one or two reels filled with banks of Wilds. The Wild substitutes for all regular symbols other than the Scatter, and carries a 2x multiplier on all winning combos. Free spins are the game’s biggest draw, with 13 freebies up for grabs when you hit three or more Scattered Potion Bottles across the reels. Five Scatters, by the way, awards a top whack of 60,000 coins, so it’s a Scatter worth smashing. Actually, while spins are enough of a draw for some – me included – there are also a few bonus rounds to be had. Yep – a few! Four in fact, and you’ll trigger one of these when you hit three Cauldron symbols on reels 1, 3 and 5. They’re all pretty much Pick Me Bonus features but they do at least provide some variety. First up is the Magic Potion Bonus. Help the witch choose from 12 bottles of potion to find the hidden cash wins. If you pick a poison, however, your turn will end. The Pumpkin Bonus gets you to choose from a selection of five plump pumpkins. If you hit a prize you’ll be allowed to either accept it or reject it and start again. You got two choices before your final reward is calculated. The Secret Vault feature has another 12 symbols for you to pick from – select three before the remaining prizes bar three are unveiled. Finally, pick another symbol to reveal your final prize haul. Finally, the Spell Book feature gets you to choose from the red, blue or green spellbooks. Choose correctly and a 52x multiplier could be yours. With some slick animation, great graphics and typically professional gameplay from an industry stalwart, Lucky Witch could see you becoming very lucky indeed. And if it’s got you in the mood for some horror hijinks this Halloween, make a beeline for two slots we’ve highlighted in the past on this site: Microgaming’s Tim Burton-esque freak show slot, Halloweenies, and Sheriff Gaming’s slick 3D adventure slot, Midnight Rush. Both are sure to give you chills and thrills in equal measure.